"Antarctic Chorus II" is a modified and decreased in sizes copy of the "Antarctic Chorus". This new pedal took in all the best of its predecessor. This stompbox is a very bright and extremely rich and dreamy Chorus effect's pedal! 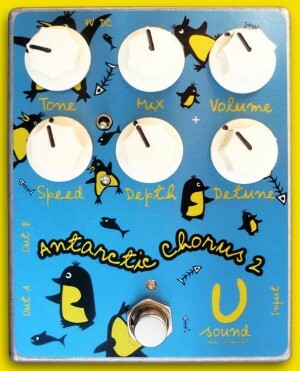 The Antarctic Chorus II is used in every different style of music from jazz to modern trends. It sounds so rich it almost rivals the sound of a 12-string guitar. It is a pedal designed to be very Lush and is a delight to hear and play through! If you look at the block diagram of the Antarctic Chorus II, it becomes evident that it is radically different from most mass-produced chorus's. negative center pin power supply. Power - 9V DC, 150ma. Sound samples presented here recorded with the previous version of the pedal, but they fully compliant of a new chorus sounding.